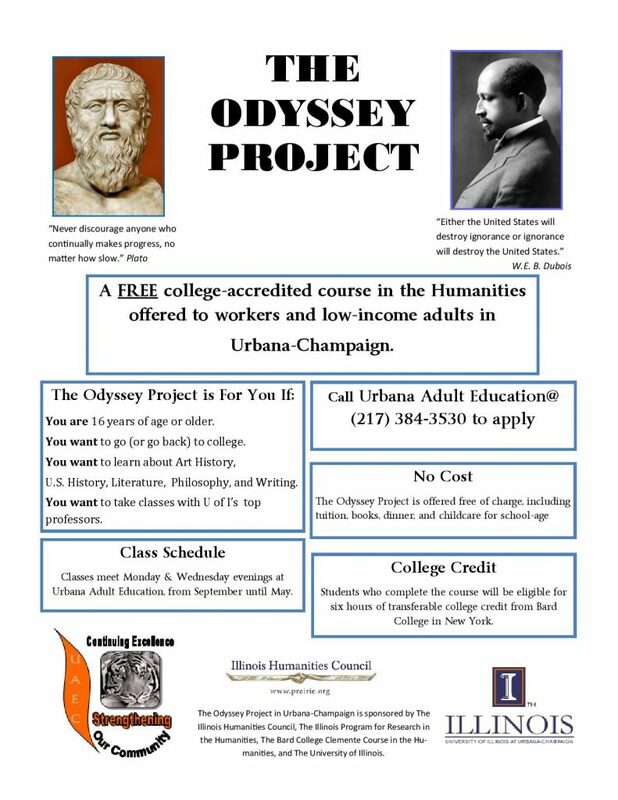 The Odyssey Project is a FREE college-accredited course in the Humanities, offered to workers and low-income adults in the Champaign-Urbana area. Classes are taught by some of the University of Illinois’ top professors, and subjects include Art History, Literature, Philosophy, and Writing. The Odyssey Project is offered completely free of charge, and includes tuition, books, free dinner, and help with transportation. Students who complete the course are eligible for six hours of transferable college credit from Bard College in New York. Odyssey Project classes are held at Urbana Adult Education Center on Monday and Wednesday evenings from 5:00 – 8:00 p.m., from August until April of each year. Click here to view our Odyssey Project’s very own blog, where you can view student works, class materials, news, and more! For more information about the Odyssey Project, please call Urbana Adult Education at 217-384-3530 or call Jennifer Burns @ 217-300-3888. Click HERE to visit the Illinois Humanities website and learn more about the Odyssey Project.